Diagnostic imaging is an instrumental tool for our practice – timely x-rays, ultrasounds or endoscopes can mean the difference between life and death for seriously ill patients. 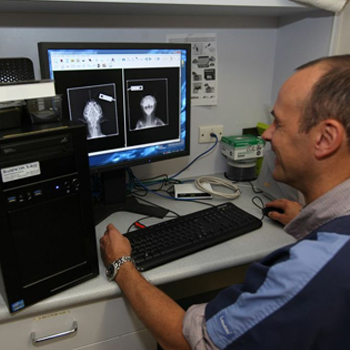 Our dedicated diagnostic imaging suite is the centre of such procedures. Our modern equipment includes radiology (standard & digital), ultrasound and endoscopy. Our powerful X-Ray unit can image everything from the smallest mouse up to the largest dog and because of the short exposure times used due to its power, we often don’t have to anaesthetize our patients to get quality images. All our vets are trained in radiology. We use a fully digital dental X-ray unit which is invaluable when assessing problems with the teeth. Our ultrasound machine is used for abdominal and cardiac scanning but can also do eyes, soft tissues and thoracic imaging. For cardiac work we have colour, pulse wave and continuous wave Doppler capability. The great benefit of ultrasound it that we can see inside organs and body cavities with a lot more detail than with radiology. This is of immense help when we are trying to diagnose various illnesses. David Loneragan and Gretta Howard do our ultrasounds. They have both completed the University of Sydney Distance Education course in Diagnostic Ultrasound and have many years of experience in performing and reading small animal ultrasounds. For endoscopic work we have one very small diameter endoscope that can look down into the larynx, trachea, lungs and nasal passages and a larger one for looking into the stomach and intestines which can take biopsy samples. Endoscopy is generally done under a general anaesthetic and is performed by Chris Boulton or David Loneragan. We also have easy access to CT and MRI imaging for more complex cases.